Our Elite Folding Rocker will give you hours of campsite comfort. Attractive Arizona tan fabric against a gunmetal gray frame make this rocker a chair that you will want to own. Elite Folding Rockers go everywhere and fold for easy storage. Steel frame, with reinforced arms and brackets, supports 250 pounds. Durable polyester fabric comes in three colors to match Elite Chairs. 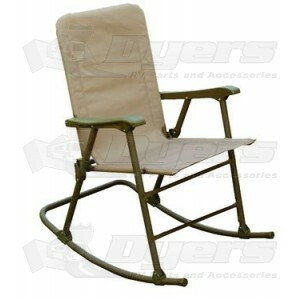 Designed for comfort by eliminating the cross bar that typically goes across the front of most folding chairs.